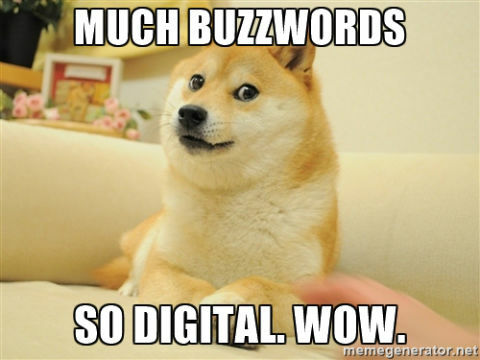 Hating on buzzwords is something of a tradition here on the Articulate blog. We’ve already compiled the Devil’s Marketing Dictionary and put the spotlight on daft business clichés. But unfortunately, buzzwords are like the Learnean Hydra: for every stupid word or phrase we call out, another emerges to take its place in the professional lexicon. So in the spirit of eradicating corporatese we’ve collected 17 phrases to remove from your vocabulary, some inspired by Silicon Valley’s entrepreneurs. This is not about being pedantic. These phrases, often overused, are essentially meaningless. Erasing them from your vocabulary is a good step towards communicating in a more clear, efficient way. 1. Guru. This is a Sanskrit word used to describe a Hindu spiritual teacher, not some guy with a huge Twitter following and a ‘thought leadership blog.’ Please stop calling people gurus. 2. Solution. A solution is a homogenous mixture made up of two or more substances, hence you should dispense this word only when appropriate and opt for terms like ‘product’ or ‘service’ instead. 3. Catalyst for change. This is a substance that causes chemical reactions to occur at a faster rate or under abnormal conditions. You are not chemical substance, nor are you a catalyst for change. 4. Synergy. From the Greek word sunergos, synergy refers to the cooperation of two or more groups to produce a common outcome. Nice sentiment, stupid word. ‘Working together’ or ‘teamwork’ is just fine. 5. Deep dive. Whales do this. You do not. 6. Pivot. When used as a verb, pivot means two things: to turn (either physically, or mechanically via an axis) or to depend on. So it has nothing to do with your startup building a new product because your first idea didn’t work out. 7. Ninja. A ninja is a person who is exceptionally proficient in the Japanese art of ninjutsu, not Salesforce or WordPress. Please stop calling people ninjas. 8. Cutting edge. Don't use this phrase unless you’re talking about the sharp edge of a blade. Look up ‘pioneering’ instead. 9. Enter on the ground floor. To ‘enter on the ground floor’ is to join a ‘soon-to-be successful’ company in its early (i.e. bootstrapped) days. It doesn’t make much sense as a metaphor, or in any other way for that matter. 10. Take it offline. Most commonly used in meetings to thwart awkward or unwanted topics of conversation, this meaningless phrase is maybe the worst of them all. Avoid this phrase unless you’re actually taking something offline. 11. The Uber for X - Remember the scene in Empire Strikes Back when Luke is training? He’s doing all the running, flips and magic tricks and Yoda’s just riding along on his back? This is probably the only time I will ever say this: don’t be Yoda. Don’t use another successful company’s brand to try and boost your own. Strive to be your own slogan! 12. Peel the Onion – This refers to the ‘examination of a problem in detail.’ Readers shouldn’t need to ‘peel the onion’ just to figure out what you’re talking about. Don’t do or say this. 13. ‘Hack’ – Are you logging into secure servers? Are you breaking into the digital vaults of the CIA? You’re not hacking. You’re giving advice. And maybe not even good advice. 14. Longest pole in the tent – In all honesty, this is probably the cleverest buzzword on this list. It refers to the ‘thing’ that holds everything up. Still, you should avoid it. Unless you’re literally talking about tents and camping. 15. Punch a puppy – This means to do something detestable for the good of the business. Evocative imagery aside, its violence is gratuitous to almost Tarantino-esque levels. Nobody likes puppy punching. 16. Disrupt – The only thing getting disrupted here is my enjoyment of your blog. This word was fine when businesses were truly disruptive within an industry. But, it’s used so often as to become meaningless. 17. Rock star or Ninja – You’ve seen it before. ‘Oh, we’re Excel rock stars.’ Yet, unlike great rock Stars and famous ninjas, these terms don’t seem to disappear and we’re sick of hearing them. For more on this, see the Devil's Marketing Dictionary. The supply of online content is seemingly infinite. A reader’s patience is not. When writing, always remember the reader wants to receive information. If you make them work too hard for it, they will go elsewhere. So if you want to keep readers happy and you have a message to share, say it straight up. Don’t drive your audience away with meaningless words and slogans. And while you're at it, take a look at these 50 words that will improve your writing.